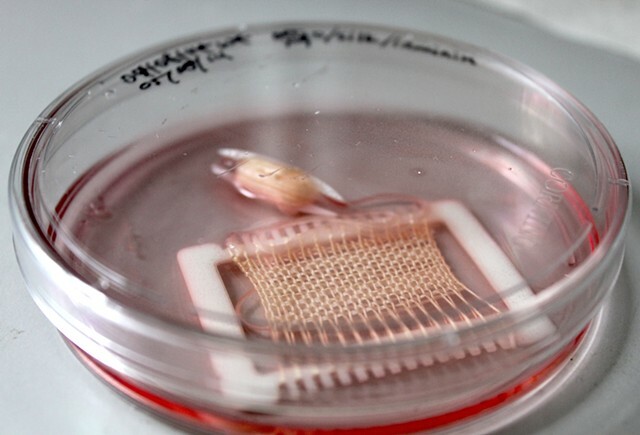 Handwoven sterilized silk on 3D printed ABS loom, 3D printed ABS weaving shuttle, laminin, osteoblasts in DMEM culture media + Ascorbic Acid + Glutamine + 10% Penicillin/Streptomycin, glass pitre dish. Handwoven in-lab using aseptic technique. Use of laminin prevented cell adhesion to the silk resulting in no significant tissue growth. Loom and shuttle printed at Alternate Anatomies Lab, Curtin University, Perth, AUS with the help of Stelarc.